Academics, artists and civilians demonstrated Sunday afternoon in Tel Aviv against what they call racist laws recently approved by the government and Knesset, which they say are contrary to the spirit of Israel's Declaration of Independence. Also Sunday, Foreign Minister Avigdor Lieberman slammed actors' calls to avoid performing in the cultural center in the West Bank settlement city of Ariel, saying he agreed there is a place for freedom of speech, "but there is no place for freedom of incitement." The demonstrators, including former Minister Shulamit Aloni, jurist Muta Kremenitzer, head of the Working and Studying Youth movement Pesach Hausfetter and actress Hanna Meron, held the protest at the old Tel Aviv Museum where Israel's independence was originally declared. Participants called for a commitment to the promises of the Declaration, in particular freedom of worship and conscience, and equal social and political rights without regard to religion, race or gender. They say a wave of public and government acts tainted by racist legislation is sweeping the country, trampling basic freedoms underfoot. Aloni said that she "feels like a stranger" in her own land. "Everyone keeps talking about Zionism," she said. "But Zionism was established in order to found a state for autonomous citizens – I have no idea what is going on today." Kremenitzer said Israel is on the way to becoming a racist state, while veteran activist and former MK Uri Avneri said the Knesset is legislating new race laws which have the character of Nuremberg's infamous race laws. The Citizenship Law, approved by the government last month, is at the center of their protest. According to the amendment to the law, all non-Jews seeking citizenship are required to swear an oath of loyalty to the State of Israel. Aloni, referring to the amendment, said that in every country a person is a citizen. "Jews in Britain are British," she said. "They have the same rights as Catholics and Protestants." Meanwhile Lieberman slammed the renewed call by people in theater not to perform in Ariel's cultural center. "Residents of Ariel serve in the army, do reserve duty, and pay income tax, and the theaters enjoy public funding," he said during a meeting with German Foreign Minister Guido Westerwelle. He emphasized there could be no "political boycott" against Israel's residents. He also noted Ariel's varied political map. "I wish to remind you that in the last elections, the residents of Ariel didn't just vote for Yisrael Beitenu; even Meretz got some votes," he said, adding that he therefore does not accept the generalization and "attempt to stain and sully" what he called a "city in Israel." He slammed the artists, saying they were people who called Israel an "apartheid state" while accepting state support for their work. "I oppose these double standards," he said. Lieberman also addressed the expected Israeli withdrawal from the northern part of the village of Ghajar, on the Israel-Lebanon border, saying it would be a unilateral withdrawal because Hezbollah torpedoed the initiative. He said it would have been possible to reach a trilateral agreement between Israel, Lebanon and the UN a long time ago, adding he had told the prime minister he should speak to the UN and not wait for the Lebanese. Prime Minister Benjamin Netanyahu is expected to present the withdrawal program to UN Secretary-General Ban Ki-moon. 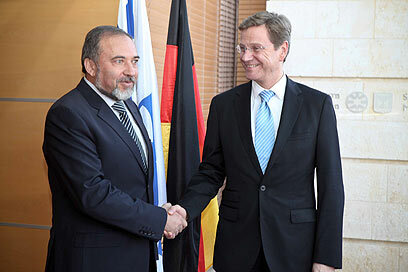 The German foreign minister presented the German government's position on the negotiations between Israel and the Palestinians, saying Israel should have renewed the construction moratorium in the West Bank settlements. "Our friends in Israel know our position regarding the settlements, which is also the EU position," he said. "We believe this it would be a wise decision to freeze the settlements." Lieberman, however, claimed the settlements were not an obstacle to peace, saying Israel had no intention of changing the demographic balance in the West Bank but that Israel must provide a reasonable life for the settlers. "About the freeze, we decided to a freeze of ten months," he said. "The Palestinians wasted nine of them." Westerwelle said his government was willing to bear the cost of a desalination station in the Gaza Strip, saying this was not a political decision but stemmed from technical and environmental considerations. See all talkbacks "Shulamit Aloni: I feel like stranger here"